Below is a post I did during the last presidential campaign explaining why I supported Mr. Romney for president. It also serves as an adequate explanation of one reason I cannot support either Secretary Clinton or Mr. Trump. Neither has any understanding of or even interest in the management and improvement principles described below. I’ve had almost thirteen years since retirement from Eastman Chemical Co where I spent my last three years or so championing something called Total Quality Management (TQM), one of the least understood management concepts ever developed. I first heard of it in the early 1980’s when big US companies were falling all over themselves trying to catch up to Japanese business models by paying big bucks to Drs. Juran and Deming and their disciples to teach the manufacturing folks how to quit making so many mistakes and creating so much waste. Few were the senior management teams that realized it was often senior management causing the problems. As a Sloan Fellow at MIT in 1989-90, I took an introductory course in System Dynamics, a discipline that focuses on modeling complex systems to show interactions and feedbacks to help decision makers avoid the sin of static thinking. Examples of static thinking errors that can be avoided by use of System Dynamics are believing that raising tax rates by 10% will result in, and only in, a tax revenue increase of 10% or that welfare programs providing enough funding to reduce the poverty rate by 50% will move half the households in poverty into the middle class. Neither erroneously expected result will occur because the systems are complex and there are feedback loops and people and prices and money behave differently after the changes are made than they did before. And those different behaviors will also reverberate through the system. 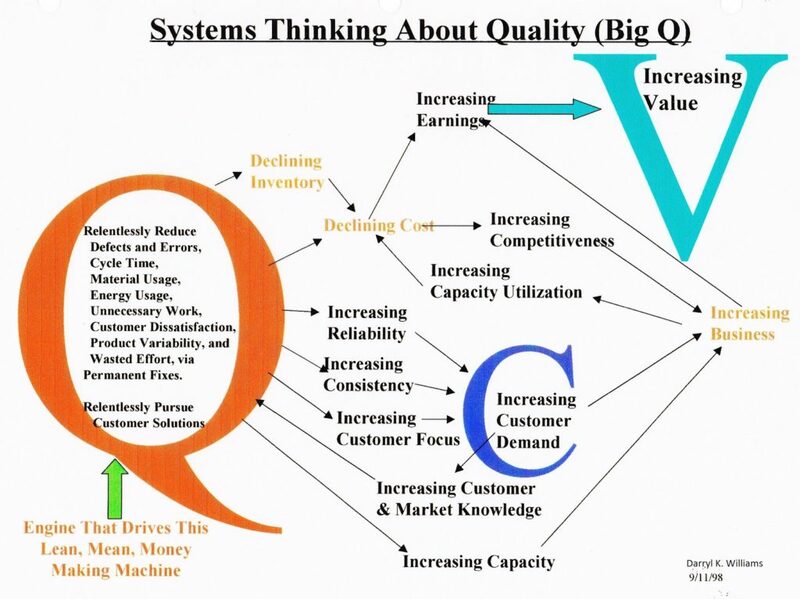 In the late 1990’s, having become a TRUE BELIEVER in TQM and having had that smattering of System Dynamics, I synthesized the two with the diagram below, my awkward explanations of which caused many eyes to glaze over. It resulted in some being happy to see me retire and perhaps a small group of people being sad to see me go. It was even the inspiration for the roast at my retirement party in late 1999. Thanks, Wylie, for the roast. I did enjoy it. Click on the chart for a better look. This diagram is targeted, of course, at businesses in competition with other businesses, the situation Eastman Chemical was in, and conveys the message that focusing on customer satisfaction and relentless reduction of defects and errors, cycle time, material usages, energy usage, unnecessary work, product variability, and wasted effort, via permanent fixes (thus the name of my blog), will result in greater capacity, greater customer demand, lower cost, lower inventories, higher competitiveness, more business, and, finally, higher value for the enterprise. I called this diagram my QVC diagram and had been inspired to create it as I worked at home, the popular QVC home shopping network on TV in the background. An essential element of both TQM and Systems Dynamics is the focus on process, whether a manufacturing process or a decision making process or a war fighting process or a poverty fighting process or a debt reduction process or a tax reform process. In the chemical industry, everybody involved in chemical processes, having studied chemistry and/or chemical engineering unit operations, understands the complexities and interactions inherent in such processes and automatically assumes a Systems Dynamics approach to understanding and improving those processes. But many people in responsible positions have great difficulty understanding that the same principle applies to management and administrative and even government processes. It even applies to medical and health care processes. TQM and Systems Dynamics offer to those responsible for management, administrative, and government processes the same kind of discipline and understanding that chemical reaction kinetics and unit operations principles offer to people running chemical manufacturing processes. And that is why I think Mitt Romney is an acceptable candidate for the presidency, not a savior, not a miracle worker, not a person to be worshiped, adored, glorified, or even cheered, but a serious and disciplined person who would look at my diagram above and say, “Of course!” He would agree that this, a combination of TQM and System Dynamics thinking, is exactly the approach we need in the USA to rebuild the economy, to rebuild the economic strength of the middle class, to improve our education, to improve our health care system, to reduce our national debt as a percent of GDP, to remain the last great hope of disadvantaged people at home and around the globe, to be all that we can be. He would understand that it is not possible to get there by a philosophy of spreading wealth, or throwing money, around because so doing only increases waste and diminishes the national wealth. He would understand that continuous short-term tweaking of the system and application of Band-Aids and duct tape and other temporary fixes would not work and would, in fact, worsen the situation. Now, whether he could help us overcome the current thirty-year trend and downward momentum in national competitiveness and economic strength, whether he would have the political skills to make a difference, would remain to be seen. But at least he would understand.